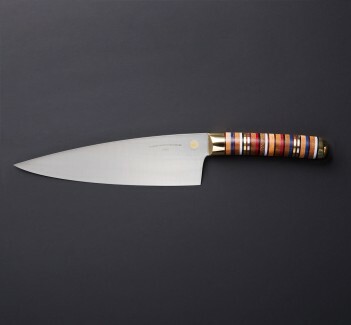 A nakiri from Jelle Hazenberg, hand-forged from san mai steel with a White No.2 core and 22-layer cladding. 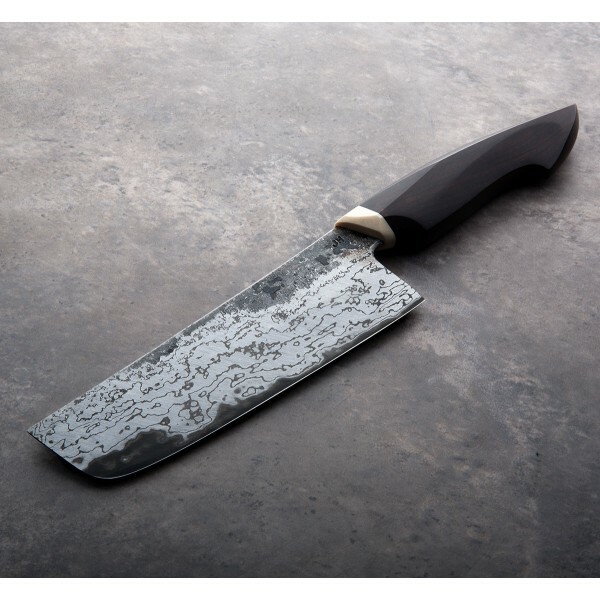 Measuring 52mm high at the choil and refined from a 2.6mm blade width at the spine to a thin, sharp and hard edge heat treated to HRC 63-64, this is a blade made for endless vegetable prep day in and day out. As nice as every handle Jelle carves, the African Blackwood Blackwood is dark, and beautiful grain can be seen with a closer look. An environmentally friendly ivory substitute, Elforyn, is used for the bolster. Each knife forged by hand, each handle carved to fit like a glove, Jelle Hazenberg's custom chef knives are quickly becoming a customer favorite of ours. His eye for design combined with outstanding geometry and balance make for one-of-a-kind tools that are both beautiful to the eye and a pleasure to use. 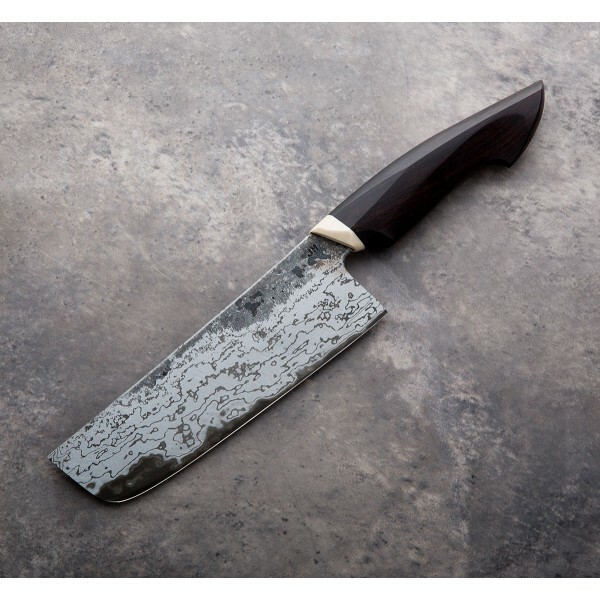 At 155mm this damascus-clad san mai nakiri is a wonderful representation of Jelle's abilities. 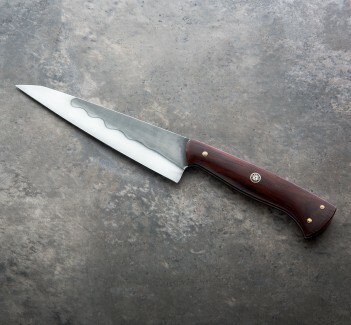 Blade length: 155mm / 6.1". Overall length: 11.5". Blade width at heel: 2.6mm. Blade height at heel: 52mm. Weight: 6.4oz / 182g. 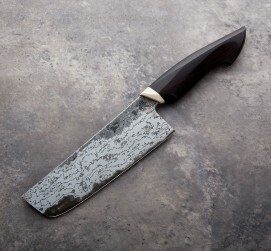 Blade Hardness: 63-64 HRC. 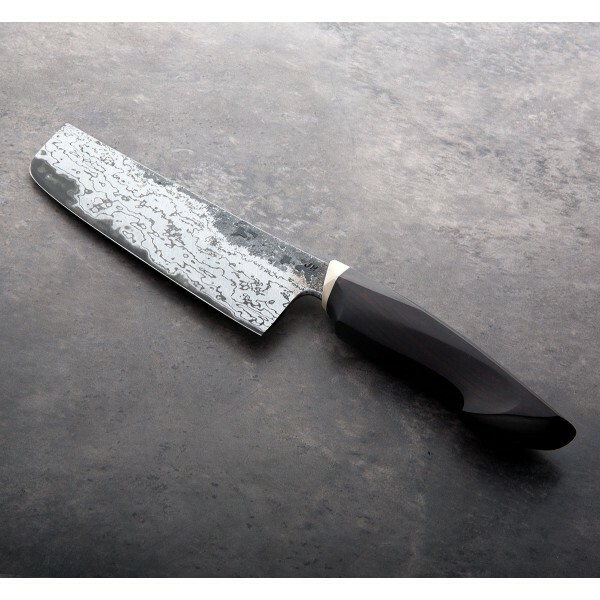 Blade: Hitachi White No.2 carbon steel core with 22-layer cladding. Handle: African Blackwood with Elforyn (ivory substitute).